Figure 1 shows a circuit diagram of the Clock Controller V1.1. P10-P1.7 drives 7-segment common anode LED with sink current. 2-digit allowing the pt. segment to be used for 1 second blinking. rectifier is used so the polarity of the input signal doesn't matter. drivers. 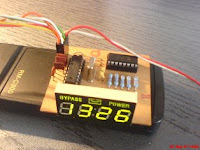 The Real Time Clock data is comes in from the PCF8563P. on the 7 segment LED's. buttons are for setting the time. MINUTES (+/-) and one for zero reset of the clock display. the time base for the clock. 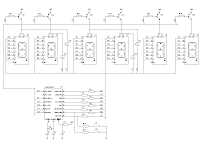 uses 74hct238 demultiplexer, 4x7 segments, and some rezistors. serial port with icprog and made/debuged with MPlab.